(SitNews) Sitka, Alaska - Madelyn Mae Dunn was the first baby of 2012 born at the SouthEast Alaska Regional Health Consortium (SEARHC) S’áxt’ Hít Mt. Edgecumbe Hospital in Sitka. 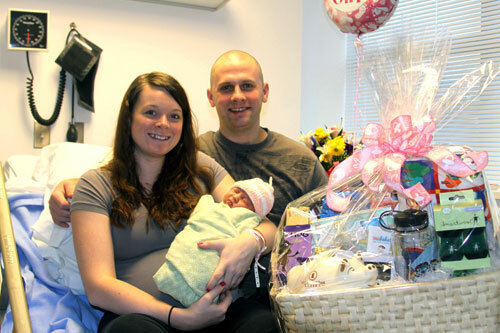 Jessica and Jason Dunn show off their daughter, Madelyn Mae Dunn, who was the first baby of 2012 born at the SouthEast Alaska Regional Health Consortium (SEARHC) S'áxt' Hít Mt. Edgecumbe Hospital in Sitka. Madelyn was born at 5:50 a.m. on Monday, Jan. 9, 2012. She weighed 8 pounds, 7 ounces, and was 21.5 inches long. Madelyn was born at 5:50 a.m. on Monday, Jan. 9, 2012. Her parents are Jason and Jessica Dunn of Sitka. Madelyn weighed 8 pounds, 7 ounces, and she was 21.5 inches long at birth. Dr. Grace Hwang delivered Madelyn, with the assistance Rose Gutierrez, RN, and Kathy Carlton, RN. Madelyn has one older sister, Meredith Marie Dunn, age 15 months. Her paternal grandparents are Randy and Christine Dunn of Beaver Falls, Pa., and her maternal grandparents are Shawn and Shelly Gillaspey of Sitka and Renée Eckley of Fergus Falls, Minn.
As the first baby of the new year born at S’áxt’ Hít Mt. Edgecumbe Hospital, Madelyn and her parents will receive several special gifts donated by local businesses, including a variety of baby supplies and numerous gift certificates. Businesses donating gifts are First National Bank of Alaska, Sitka Lutheran Church, Russell’s, Airport Gift Shop, Sea Mart, White’s Inc./Harry Race Pharmacy, Agave Restaurant, Alaska Basket Company and SEARHC.